The Monmouth cap was an item of woollen headgear fashionable between the 15th and 18th centuries, and associated with the town of Monmouth in south east Wales. The knitted round caps were used by both soldiers and sailors, and they were widely exported. In the early 14th century, the area immediately north of Monmouth, known as Archenfield, became known for the high quality of its wool, produced from Ryeland sheep. The wool was ideal for the production of high quality felt, and the location of Monmouth, on the River Wye some 18 miles (29 km) inland from the Severn estuary, allowed the produce of the area ready access to wider markets. The industry of cap manufacture by hand knitters in and around Monmouth was well established by the 15th century, when court records show Capper as a common surname in the town. The cappers or knitters, generally men, were attached to the Weaver's Guild and may have been governed by a Council of Master Craftsmen. The trade is thought to have flourished particularly in the Overmonnow area, known at one time as "Cappers' town". However, antiquarian sources state that much of the trade moved from Monmouth to Bewdley in Worcestershire at some point, following an outbreak of plague at Monmouth. The headgear reached the height of its popularity in the 15th and 16th centuries. Monmouth caps were essential equipment for soldiers, sailors and labourers of the period, so familiar and widely used that they were taken for granted. According to one 19th century encyclopedia, they were at one time "worn by a large portion of the population of England and Wales." 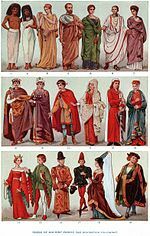 The Cappers Act of 1488 forbade, on penalty of a fine, the wearing of foreign-made caps in England. A further Act of Parliament in 1571, during the reign of Elizabeth I, stated that every person above the age of six years (excepting "Maids, ladies, gentlewomen, noble personages, and every Lord, knight and gentleman of twenty marks land") residing in any of the cities, towns, villages or hamlets of England, must wear, on Sundays and holidays (except when travelling), "a cap of wool, thicked and dressed in England, made within this realm, and only dressed and finished by some of the trade of cappers, upon pain to forfeit for every day of not wearing 3s. 4d." This legislation was intended to protect domestic production, as caps were becoming unfashionable and were being challenged by new forms of imported headgear. It was repealed in 1597 as unworkable. Fluellen: "Your majesty says very true: if your majestie is remembered of it, the Welshmen did good service in a garden where leeks did grow, wearing leeks in their Monmouth caps; which, your majesty knows, to this hour is an honourable badge of the service; and I do believe your majesty takes no scorn to wear the leek upon Saint Davy's day. In the 1620s, the sponsors of the Massachusetts Bay Colony ordered Monmouth caps - described as "thick, warm, fulled by hand- and foot- beating and much favored by seamen" - as part of the outfitting of the settlers. Daniel Defoe, in his 1712 Tour through the Whole Island of Great Britain, described Monmouth caps as being worn predominantly by Dutch seamen. Peter the Great of Russia wore one when working for the East India Company in 1697; it is preserved in the Hermitage Museum in St Petersburg. The caps were increasingly made outside Monmouth, and the term "Monmouth cap" became a generic one. Other areas, such as Coventry, produced other varieties of cap, and similar caps were known simply as knitted caps, Kilmarnock cauls, Scotch bonnets, or watch caps. Thousands of Monmouth caps were created, but their relatively low cost, and the ease with which the knitting could unravel, means that few remain. 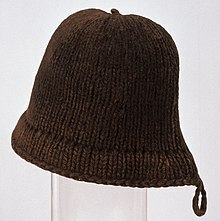 The picture of the brown hat with the carrying loop is from Monmouth Museum and shows this rare example, which was knitted from coarse 2 ply wool. 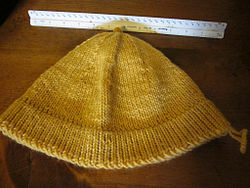 The cap was made by casting on at the lower edge and knitting in the round towards the top. The crown consists of a classic rounded top, with the last remaining stitches cast off. The yarn tail was wrapped around just below the cast off stitches to gather them, leaving the little lump commonly, but inexactly, referred to as a button. The doubled brim was formed by picking up stitches inside the body of the cap, and worked down to the original cast on. The cast on loops were picked up, and a 3 needle bindoff worked to finish and join the inner brim to the outer cap, ending with a little loop. Patterns that attempt a stitch for stitch reproduction sometimes result in a cap that is slightly too narrow, after felting, due to the different felting characteristics of modern knitting yarn. Each hat was made weatherproof by felting, a process which reduced its size. The distance from the centre to the hem in this example varies between 5 and 6 inches (150 mm). Similar caps are now produced for historical reenactment organisations. The small area known as "Monmouth Cap"
The Monmouth Cap Inn was a coaching inn located on the main road between Abergavenny and Hereford, at Llangua on the River Monnow. The river marked the boundary between Herefordshire and Monmouthshire. The inn was the property of the Kentchurch estate, and adjoined a ruined priory. 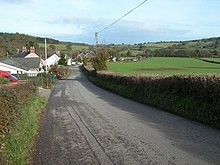 Although the inn has closed, the name Monmouth Cap remains in use for the locality. ^ the Society for the Diffusion of Useful Knowledge (1839). Penny Cyclopaedia. London: Charles Knight and Co. p. 334. Retrieved 2012-03-20. ^ Allmand, Christopher (September 2010). "Henry V (1386–1422)". Oxford Dictionary of National Biography. Oxford, England: Oxford University Press. doi:10.1093/ref:odnb/12952.